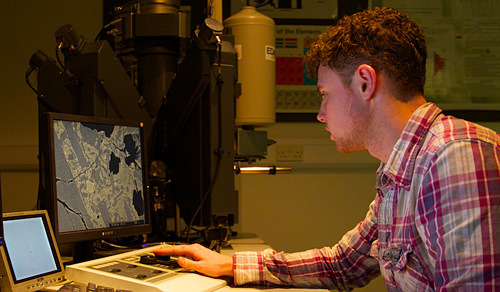 The scanning electron microscope (SEM) provides a service to the Earth and Environmental science community as well as to all departments within the University of Bristol. 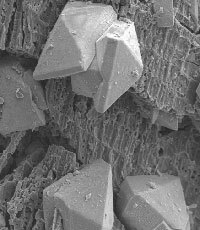 The SEM is run in conjunction with two electron microprobes, which enables us to provide a full range of electron and x-ray imaging, together with in-situ chemical analysis of both major and minor elements heavier than carbon. The scanning electron microscope facility operates a Hitachi S-3500N variable pressure microscope equipped with Thermo Noran energy dispersive spectrometer (EDS x-ray detector). This allows both coated (gold or carbon) or uncoated specimens to be quickly and routinely imaged and analysed. The microscope is fitted with a tungsten filament which produces a stable and high beam current, making it ideal for x-ray analysis. Ultimate resolution is better than 10 nm at 25 kV, using the secondary electron (SE) detector. The instrument is equipped with a backscatter electron (BSE) detector which allows imaging of specimens that have a mean atomic mass change of ~>0.1. The machine may also be used in low vacuum mode (>200Pa) in conjunction with the environmental secondary electron detector (ESED) and BSE detector. This enables electron imaging of both uncoated and hydrated samples. The machine is also equipped with a Peltier cold stage, which can be used to cool samples in situ to –30oC. Irregular shaped samples may be accommodated, with the stage allowing movement in the x, y and z directions, as well as rotation and up to 60o of tilt at moderate working distances. The EDS detector (www.thermoscientific.com) provides both standardless quantitative analysis and advanced x-ray mapping capabilities of elements heavier (and including) carbon. Detection limits are in the order of 0.5 wt% (depending upon element and operating conditions) and analytical volumes around 2 to 3 cubic microns (again, dependant upon operating conditions). All images are saved as high resolution bitmaps and may be retrieved using a recordable CD. Samples may be uncoated, carbon or gold coated. Facilities to carbon or gold coat are housed within the facility. The Electron Probe Microanalyser (EPMA) is a non-destructive technique for the analysis of polished and carbon-coated specimens. Analyses can be made at individual points (usually 1 to 40 microns in diameter) or over small (usually < 1mm2) areas of the sample surface to produce geochemical maps. Using the instruments at Bristol, almost every element of the periodic table can be determined with the exception of those with atomic numbers lower than boron. Specimens are introduced into the sample vacuum chamber and viewed under high magnification to select areas of interest. A beam of electrons is fired at the sample surface producing X-rays with energies and wavelengths specific to the elements present. Instrument calibration is carried out by analysing standards with known compositions. An example of the use of EPMA is in the study of subtle chemical zoning in minerals by element mapping, which is often invisible using light microscopy. The School has two EPMAs. The facility provides a service, not only for the Earth and Environmental Science community, but also for all departments within the University of Bristol. The newest acquisition to the Electron Microbeam suite is a JEOL JXA8530F Hyperprobe installed in 2012. It is equipped with a Field Emission Gun electron source and thus provides the highest possible spatial resolution. Our older 'probe is a Cameca SX100 microprobe, installed in 2003. Both instruments are equipped with 5 wavelength dispersive spectrometers and 1 energy dispersive spectrometer.